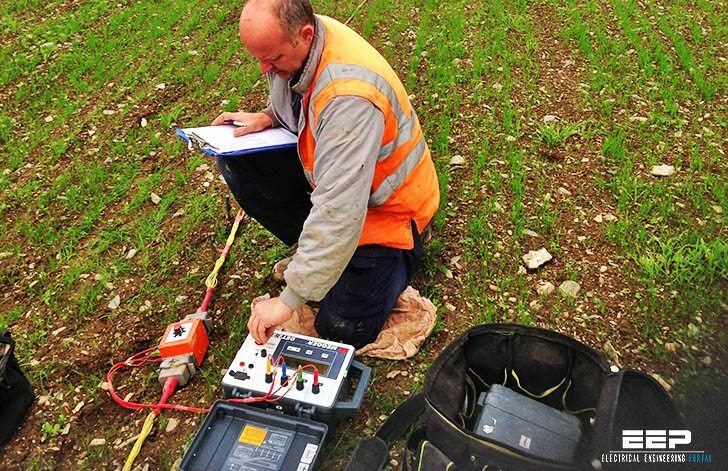 The basic philosophy of any earthing and earth installation should be an attempt to maximise the surface area contact with the surrounding soil. Not only does such this help to lower the earth resistance of the grounding system, but it also greatly improves the surge impedance of the grounding system due to the large capacitive coupling which is achieved. The benefits of a small amount of capacitive coupling into the surrounding earth is greatly enhanced when one considers that the fast rising edge associated with the lightning impulse has an inherent high fundamental frequency. 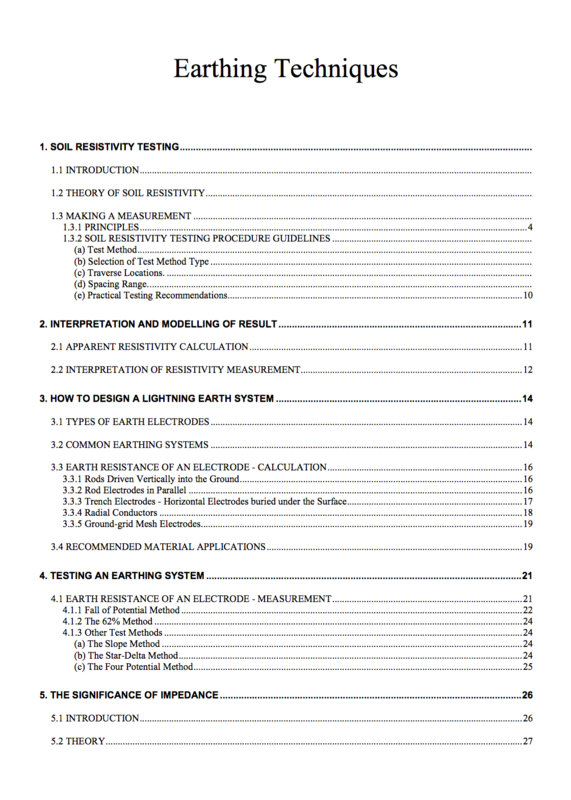 The actual layout of the earthing system will vary with the usages (lightning protection earth only, 50Hz power earth or combination) type of soil and space availability. A) Single earth rod, B) Earth rod with Cu subterranean tape, C) Multiple rods, D) Radial tapes, E) Crows foot earth, F)Earth enhancing compounds placed around the earth rod, G) Insulated PVC sleeve can be used to ensure the lightning current is injected into the ground at a depth below the surrounding surface. 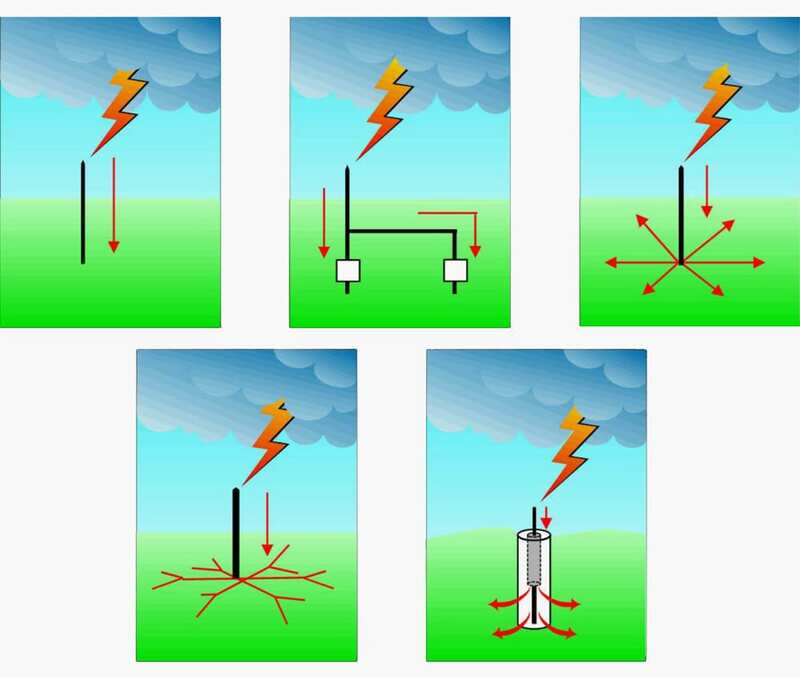 Common lightning protection earths are shown in Figure 1 – Methods of earthing. Single earth rod, which is not generally acceptable other than in areas with a constantly high water table. Earth rod with Copper subterranean tape. This is an improvement upon A, but not as effective as D) and E). Combination of rods and tapes are most commonly used. When two earth rods are used, spacing should be at least twice the depth to which the rods are driven. The use of radial tapes greatly improves the surge impedance of the earth system, by increasing the capacitive coupling to the soil. This technique is more effective than a single long conductor, A), due to the effective length of the conductor. A crows foot earth mat further improves on D above when longer radials are required. The crows foot fills in the area between the initial radials. Earth enhancing compounds placed around the earth rod improve the rod-ground interface. Earth enhancing compounds can also be used with horizontal conductors. In areas where step potentials are of concern, an insulated PVC sleeve can be used to ensure the lightning current is injected into the ground at a depth below the surrounding surface.